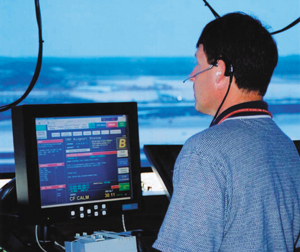 An air traffic controller at work at the Dulles Airport Traffic Control Tower in Virginia. Last month, the federal government announced a new plan will overhaul the nation's air transportation system. The government last month unveiled a new plan that calls for overhauling the nation's air transportation system in anticipation of dramatically increasing demand for air space. Although the plan looks 20 years ahead to 2025 for completing the new system, industry officials said they expect the first opportunities to come this year as the government begins the effort. Ultimately, the plan will bring billions of dollars in new contracts for federal aerospace integrators. The Transportation Department and the Federal Aviation Administration led the creation of the Next Generation Air Transportation System (NGATS). The effort included a coalition of other agencies, including NASA, the President's Office of Science and Technology and departments of Commerce, Defense and Homeland Security. Industry has taken a hands-on role by helping to write the plan and its objectives. Of keen interest is the development of the architecture for the program. Eight integrated product teams of industry and government experts are working on action plans based on NGATS' strategies and eventually will determine the nuts and bolts of the transition to the new air transportation system. "There is a need to have a set of professionals focused on the generation of the architecture and solution sets for an airspace for 2025 and beyond," said Don Antonucci, president of Lockheed Martin Corp.'s air traffic management division. One of the first steps is to develop a systems architecture by 2007, said Howard Aylesworth, director of air traffic systems at the Aerospace Industries Association, a trade group in Arlington, Va., that represents aerospace industry manufacturers. Down the road, industry officials anticipate contracts for laying out the overall plan, systems engineering work, equipment sales and satellite navigation systems, to name a few. For example, Honeywell Aerospace, a business unit of Honeywell International Inc. of Morristown, N.J., wants to sell equipment that airplanes and ground systems need to support pilots, said Chris Benich, director of strategic marketing for Honeywell Aerospace. Boeing Co. is looking to sell more commercial planes "in an unconstrained market," said Kevin Brown, vice president and general manager of Boeing's air traffic management division. The effort to create the Next Generation Air Transportation System was started in 2003 by congressional charter. Today's air transportation system in the United States will not be able to handle the threefold increase in air traffic expected over the next two decades, industry experts said. For example, the country's commercial air traffic industry, including both large carriers and regional and commuter carriers, transported 641.4 million passengers in 2003. This number will grow to nearly 1.1 billion passengers annually by 2015, according to the FAA's aerospace forecast for fiscal 2004 through 2015, issued last March. "It won't be long before the nation's airspace will be filled with more aircraft of all kinds, like air taxi services, new commercial jetliners, on-demand microjets and commercial space vehicles," said Transportation Secretary Norman Mineta in a news release Dec. 15, when he unveiled NGATS. "This plan sets the course as we begin our journey into the second century of aviation." The plan covers specific areas for modernizing the air transportation system, including airport infrastructure development, security, the air traffic system, information technology, safety management, environmental stewardship, weather forecasting and global collaboration. The plan also addresses the need for new security measures to move a growing numbers of passengers quickly and safely through security checks and onto planes. "Doing business the way we do business now is not going to work when there's double or triple the demand on the system in 25 years, so new technologies ... need to be found to meet the challenge," said Karl Grundmann, communications director of the Joint Program Development Office (JPDO), which is overseeing the plan's development and execution. Government and industry officials also said the modernization effort is needed to ensure that the U.S. aerospace industry remains a strong engine of economic growth and a global leader. The new system will integrate newer technologies, largely based on the Defense Department's network-centric operations and information technology used for its military air system, those involved with the plan said. The Defense Department's network centric system will be the Rosetta stone for NGATS, Brown said, referring to the black basalt stone discovered in 1799, which is credited with providing the first clue to deciphering Egyptian hieroglyphics. Other ongoing air traffic technology modernization efforts, such as the Standard Terminal Automation Replacement System, eventually will be blended into the NGATS program, industry experts said. Despite the progress that has been made drafting NGATS, question marks about the huge undertaking remain. Contractors are concerned that the program could be affected by across-the-board agency budget cuts, the federal deficit, spending increases on homeland security and Iraq reconstruction. FAA, for example, said late last year that it would scale back some of its systems modernization activities to cover salaries and training for the 12,500 new air traffic controllers it expects to hire over the next decade to replace retiring employees. For the current fiscal year, JPDO has received $5 million from both FAA and NASA to establish the plan's framework architectures and the basic systems engineering process. The agencies involved in NGATS are already spending money on other projects relative to JPDO's objectives, Benich added. But apart from fiscal 2005 money, future funding levels are unknown. Industry also is worried that the various agencies involved will become mired in their own needs, and that the plan will get pushed to the back burner. "The issue will be can we create awareness in the government among all these competing needs," Benich said. He suggested making the project a national priority by presidential decision directive or within Congress. "2025 is so far off. It's relatively easy to delay," Antonucci said. "We must get working by 2005, 2006, 2007 for the system to be fully implemented by 2025." But Brown said that a senior policy committee, chaired by Mineta, that oversees JPDO likely will ensure that the parties involved stay on track with the project. The executive level oversight has the potential to manage complex programs, he said. Because the project includes many stakeholders besides members of the aerospace industry, such as manufacturers, related service providers and general business and aviation entities, the project's success depends in part on "their willingness to come to a compromise solution and do the right thing for our nation," Brown said.